Not to be confused with the well-known (and beloved) plant commonly known as geranium, the hardy geraniums (also known as cranesbills) belong to their own genus. “whereas Pelargonium is essentially a genus of warm-temperate conditions, with very few species being hardy in Britain, Geranium is equally characteristic of cool-temperate conditions… [and] come from the temperate norther part of Eurasia and its more southerly mountain regions, and from temperate and mountainous parts of North and South America. 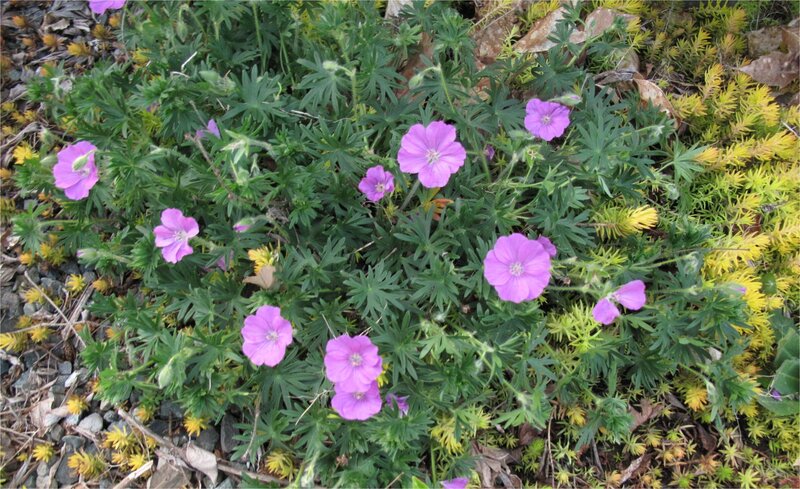 But practically everywhere that suitable climates are to be found Geranium will be found too, including South Africa, the Arabian peninsula, the Indian peninsula, Taiwan, Indonesia, New Guinea and the Hawaiian Islands. In addition it is found in Australia (including Tasmania) New Zealand, the Azores, Canary Islands and Madeira.” — from Hardy Geraniums by Peter F. Yeo , published by Timber Press, 1985, 1992. 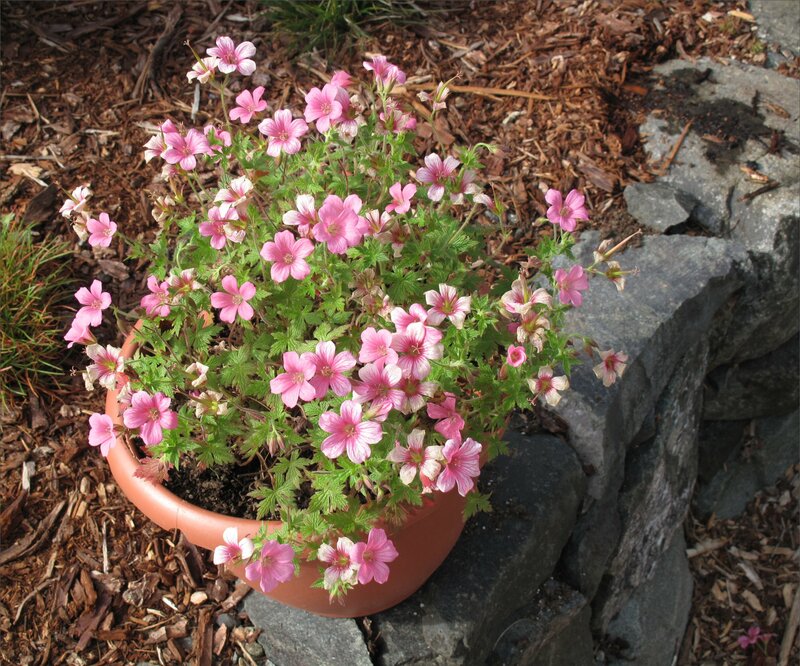 The hardy geraniums seem to mostly flower in late spring or early summer, many with repeat blooms right through the fall, especially if you deadhead or shear the clump after the initial flush of bloom. 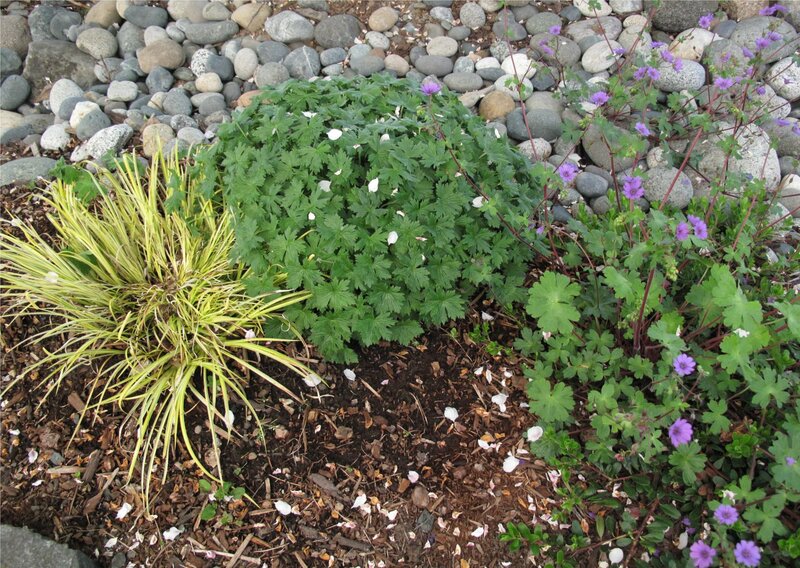 Here in the maritime Pacific Northwest my geraniums are just starting to bloom after two or three days of unusually high temperatures and a very wet March and April. I have some older varieties, probably very familiar to British gardeners, where Hardy Geraniums were popular before they caught on here in the States. The alternative name Cranesbill comes from the fruit of the plant that forms on some species after the flowers fade, which apparently resembles a Crane’s bill to some observers. I find them messy looking and deadhead them or shear them away. Two of my older varieties, Geranium x Oxonianum and Geranium hymalayense ‘Birch Double,’ don’t seem to have much of a crane’s bill after the flowers fall off, an added plus for me. Here are my five reasons why some varieties make great garden plants, followed by more pictures of some of my favorites. Many of the shorter cultivars and crosses make the tidiest clumps of leaves in springtime. Great foliage plant for early spring! And great for the front of borders. They seem to be insect and pest free, except maybe for deer and possibly rabbits. 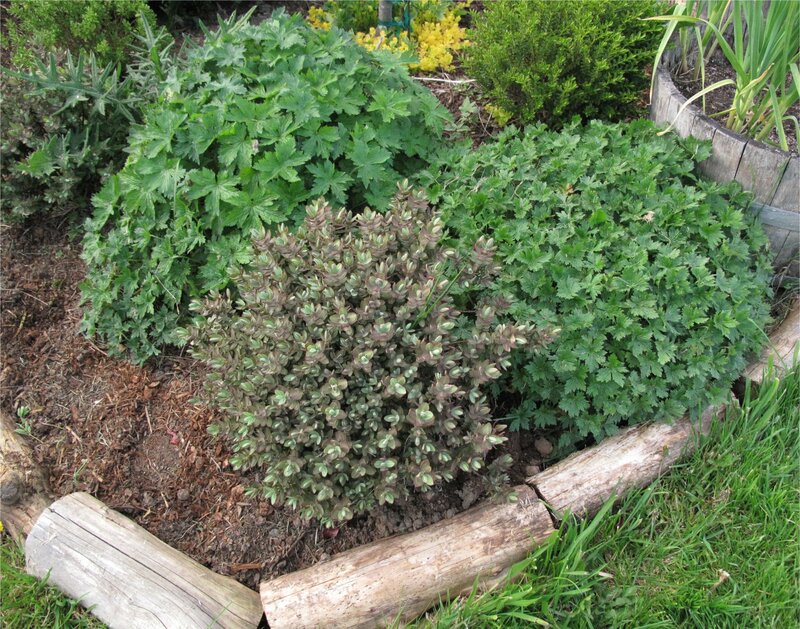 Requires little maintenance: Removal of previous years growth in winter or early spring and occasional shearing or deadheading is all that’s generally required. Flowers are profuse, though some of the harder to find doubles are less vigorous. Reseeds readily, making them easy to pot up and share with friends. While division of the dormant parent clump in winter ensures you get the same flower. I’ve had some plants for 15 to 20 years, especially Geranium hymalayense ‘Birch Double’, which I bought at a plant sale in the 1980s. Of the five or six varieties I have in my garden, at least four have flowers that come true from seeds; Geranium x Oxonianum ‘Claridge Druce’ seedlings seem to be just like the parent flowers, so apparently it comes true from seed. Other geraniums around the garden seem to have seedlings that show variation, but I don’t mind. If something doesn’t come true from seed, and it’s worthy of keeping, I just make an effort to propagate it by division. 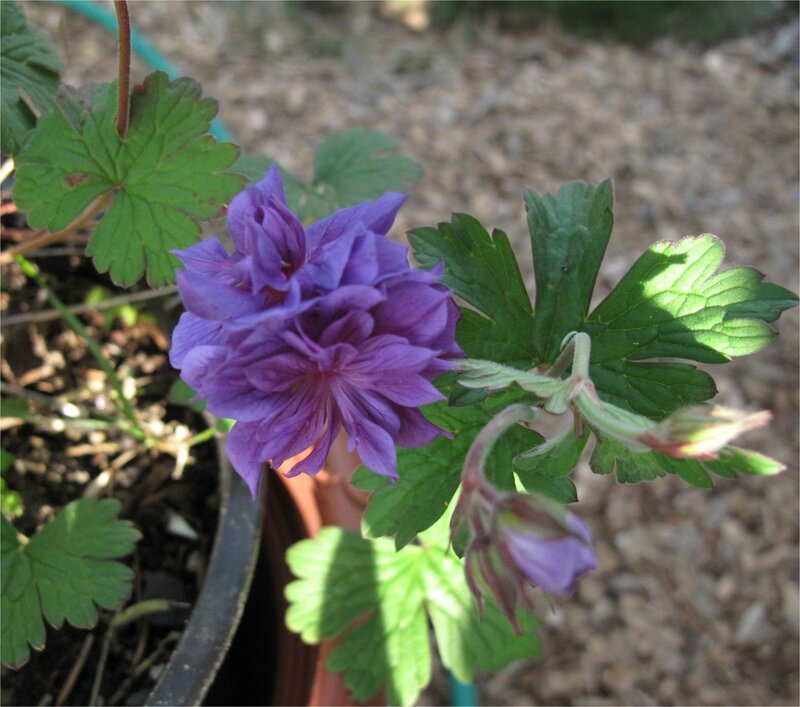 For more on Geranium x Oxonianum ‘Clardige Druce’, see this previous post. 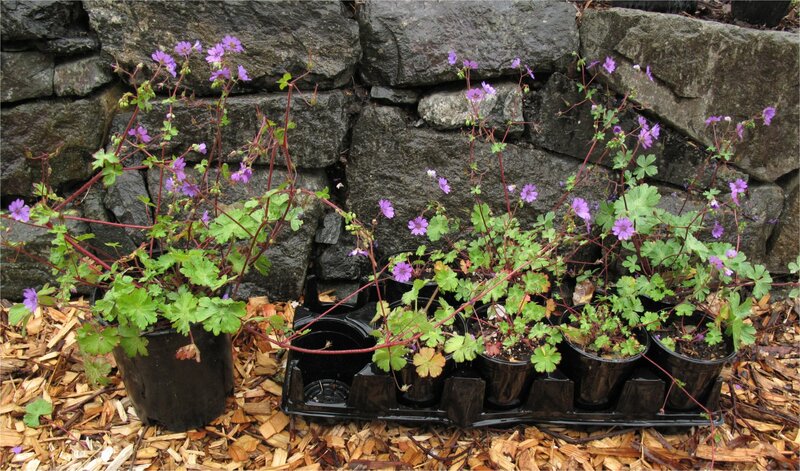 This entry was posted in Plant Picks and tagged Geranium himalayense 'Birch Double', Geranium himalayense 'Plenum', Geranium pyrenaicum 'Bill Wallis', Geranium x Oxonianum 'Claridge Druce', hardy geraniums by Bart Arenson. Bookmark the permalink. I’m going to follow her advice (when I get it) and cut it back hard when it gets leggy, just to have that nice mound of great leaves. Do you whack it back hard as she does? I agree with you on hardy geraniums. I have quite a few, mostly ‘Johnson’s Blue’ but also ‘Biokovo’ and ‘Tschelda’. I love HG’s too! I have several of the ones you noted but have not tried ‘Claridge Druce or ‘Birch Double’. Very nice! Thanks for commenting Andrea. I love to share or trade plants and I’m happy to send you some seed of my Claridge Druce. I’m looking forward to exploring your blog. I love geraniums and have quite a few different varieties. I just discovered that there were double geraniums this year and ordered a set of them from Breck’s. It turns out that they sent the wrong plant, and I didn’t get Birch’s Double. I’m so disappointed as now I find it’s sold out everywhere else. Do you ever do trades with others in the area? Would you be interested in trading with me? I love to trade plants or give them away outright. Right now I have my one main plant of Birch Double in a pot and it’s rather week this year. I have a few small seedlings entangled in other geraniums, but the leaves of “Birch Double are distinct. I plan to tease them out soon carefully (in the next couple of weeks) and pot them up in 4-inchpots. One will be for you. Email me directly and we’ll arrange a way to get you one. You rock! I’ll look around the garden today and see what I have that I can share with you. Thank you!